Registration for WeSSt CoaSSt Gathering 5 is now open for business!!!!!!! 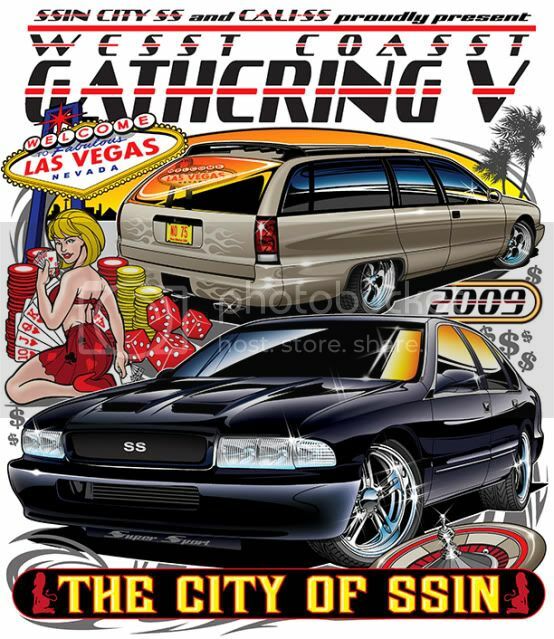 Just go the ssincityss.com or wesstcoasstgathering.com and select the WeSSt CoaSSt Gathering option on the left side. You will be able to complete the online registration, download the registration form, and the event flyer. Let's get this thing rolling!!! Go to this site and you can get the rooms for $48 a night!!!!!!! Thanks to one of the Cali-SS guys for finding this. Working on some sponsors Jim. This IS the SHOW to try to attend. The Cali-SS SD fellas will be there as well. well, I can't post links yet, or private messages either, until I reach 5 posts. Good to see more community options offered. This one is quite neat, opened TO ALL IMPALAS no matter the size, color or shape. Just received an email from Ashley from RockAuto Marketing Department, they said want to sponsor WCG!!! We got a couple more sponsors for the event. SStrange Motorsports (Jose) will be another sponsor!!! He will be donating some interior parts. FYI, some of these are very hard to find, discontinued parts. Zack Kanter with PowerPerformanceMotorsports has joined up for WCG!!! Looks like he will donate a front end kit and a set of springs! I'm not sure who from that area is going to come. Everyone stays at the Silverton, in previous posts I put the link for on line search to get the best hotel deal.if you want you can find cheaper deals at other hotels. You will have a blast coming here for the show! Let me know if you need anything or help. Suncoast hoods has stepped up for the event. They will be a sponsor!!!!!!!!!!!!!! Impala Procharger kits, and 10% of any dyno tuning. Thanks to Karl at NRP!!!!!! It will be a certificate we will auction off at the car show. Here is the artwork that will go on the shirts and trophy's. The cars should look very familiar to everyone here on the forums, the Impala is SStealth LsX (Luis from San Diego) and the wagon belongs to GoldSSWagon (Jerry from Albuquerque). Congrats guys your cars look great! I hope to see everyone in Sept!